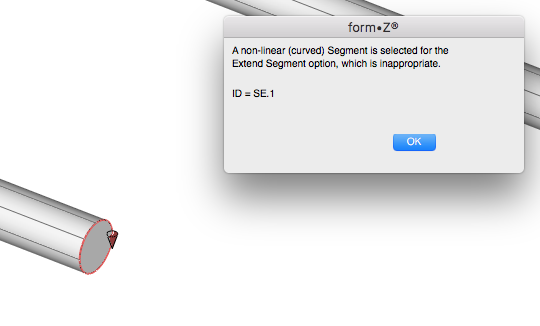 Per the title of this post, I would like to see this added to many of the warning pop-ups in formZ. Notably, I see this using the Triangulate tool and when Exporting. Every. Single. Time. It's quite annoying and 100% unnecessary to see this after every triangulation and/or export. I suppose a "Do Not Show Again" may not be appropriate here, but maybe formZ can be smart enough to know that in this case where it is "inappropriate" to extend the segment that I am trying to extend the face. Shouldn't be too hard, right?? i don't even remember how many times for years this has been reported , also by me. wonder if it ever will be fixed. sigh. we had a repository of feature requests for past version with all these notes. all gone after setting up the new forums. maybe autodessys could set up a sticky feature request thread again here, organized by main topics, like UI, tool requests, import / export of data etc... ? like reddit, but for formZ bugs and suggestions would be cool. a user can post a bug/issue, then other users can log in a upvote the problem/request. top problems get addressed.